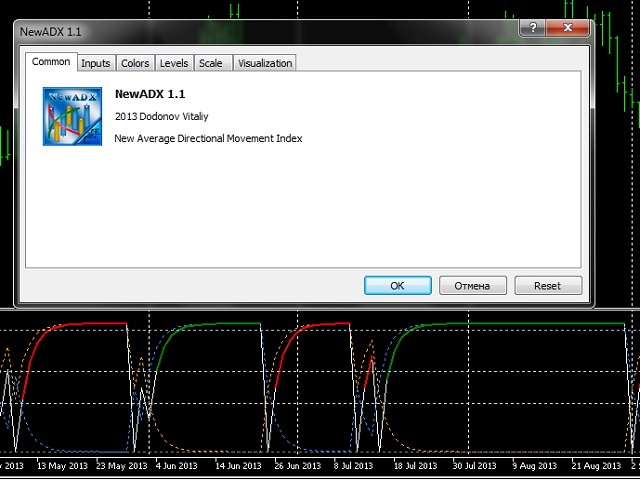 ADX (Average Directional Movement Index). This indicator was developed by J. Welles Wilder. It serves as an indicator of directional movement (i.e. trend) strength. The calculation of directional movement index (DMI) is based on the assumption that where there is an uptrend, today's high should be higher than yesterday's high. Conversely, where there is a downtrend, today's low should be lower than yesterday's low. ADX is often neglected due to its obvious disadvantage associated with the lack of correlation with price movements. It is extremely important to clearly understand that ADX itself does not indicate the market direction. The ADX indicator might be falling when prices are going up and growing when they are falling. It is intended to measure trend strength, instead of its direction. 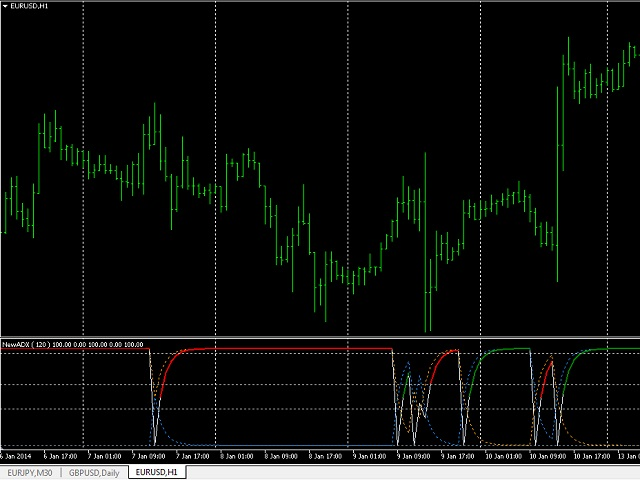 A growing ADX indicates a strong trend and suggests using trend-following trading strategies. Technical indicators that need strong trends to yield big profits, such as moving average crossovers and breakout methods should in this case work very well. 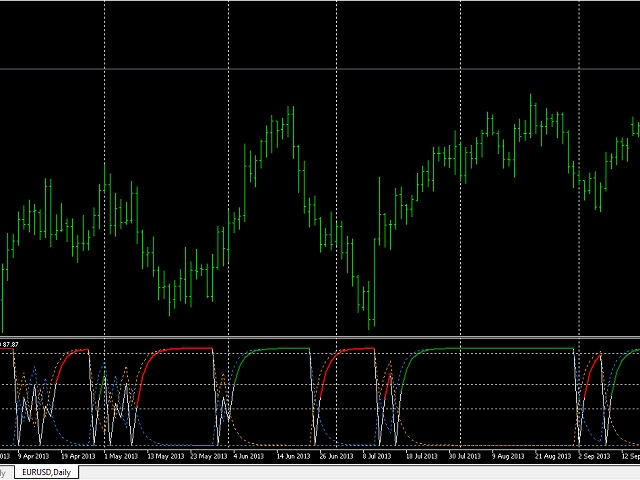 A falling ADX suggests a non-trend market that requires a counter-trend strategy, rather than trend-following methods. 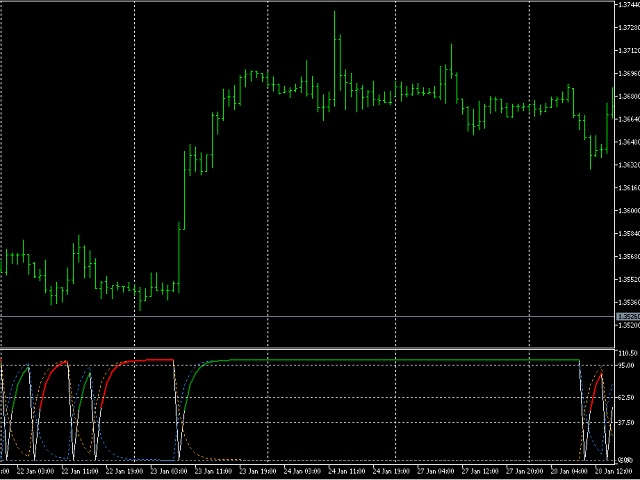 Since the calculation of ADX is based on the DMI (Directional Movement Index) data, both of them are often used as the single ADX indicator. DMI is represented by two lines: +DI (positive directional indicator) and -DI (negative directional indicator). A crossover of these two lines suggests either a potential change in trend or a starting correction. A situation where the +DI is above the -DI suggests that an uptrend is currently prevailing. When the -DI is above the +DI, we have a prevailing downtrend. If the +DI is above the -DI, while ADX is rising, it may safely be said that the uptrend is gaining momentum. If the -DI is above the +DI, while ADX is rising, it may safely be said that the downtrend is gaining momentum. If the +DI is above the -DI, while ADX is falling, it suggests that the uptrend is losing momentum (i.e. the uptrend is becoming a sideways trend). The trend may further continue or change direction to its opposite. If the -DI is above the +DI, while ADX is falling, it suggests that the downtrend is losing momentum (i.e. the downtrend is becoming a sideways trend). The trend may further continue or change direction to its opposite. 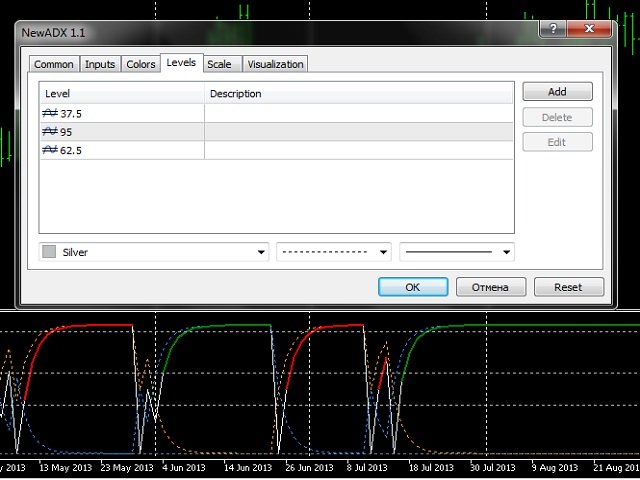 The minimum lag (1 bar) between the crossover of the DMI lines and the ADX growth start. It has its own overbought level. When this level is hit or crossed by the DMI lines or ADX, we can soon expect the trend to slow down or change to the opposite. It has three levels by default: 37.5, 62.5, 95. 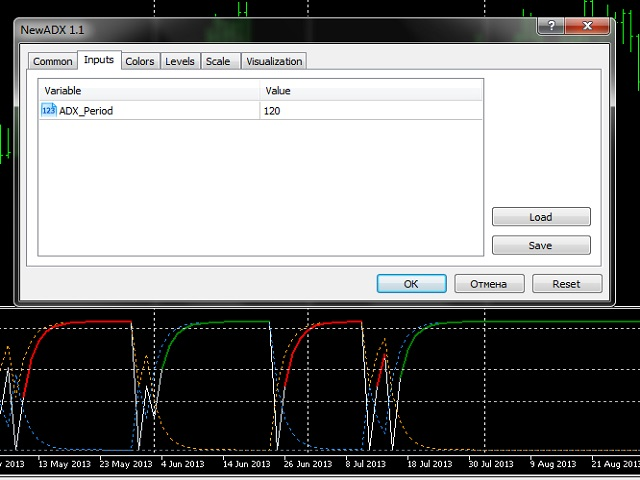 The first two are used to filter minor fluctuations of the DMI lines. Level 95 is the overbought level. The indicator has one input parameter, ADX_Period, that is used to specify the period on which the indicator values are calculated. NewADX - AliceBlue. It corresponds to the ADX line and suggests that the trend is currently losing momentum. +NewDI - DodgerBlue. This line corresponds to the +DI. -NewDI - Orange. This line corresponds to the -DI. NewADXcolorGreen - Green. It corresponds to the ADX line and suggests that the uptrend is currently gaining momentum. NewADXcolorRed - Red. It corresponds to the ADX line and indicates that the downtrend is currently gaining momentum. 2. Quicker reaction on tendency change. 3. 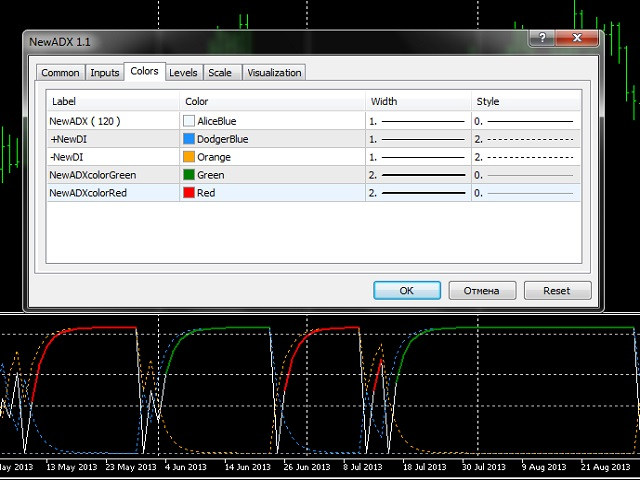 No limitations for InpPeriodADX variabel in the settings of the indicator. 4. Due to increased sensitivity it better tracks impulses when using small values for InpPeriodADX (for example: InpPeriodADX=5).